Believe it or not, the core of Node.js is very small. Basically, Node.js doesn’t do a lot. However, Node.js is very rich thanks to its extensibility. These Node.js extensions are called modules. There are thousands of modules that offer varying features: from managing uploaded files to connection to MySQL databases or to Redis, via frameworks, template systems, and management of real-time communication with visitors. There is pretty much everything you could dream of and new modules appear every day. We’re going to begin by looking at how modules are managed by Node.js and we’ll see that we can create our own easily. Then, we will look at NPM (Node Package Manager), an essential tool that allows you to easily download all the modules from the Node.js community. 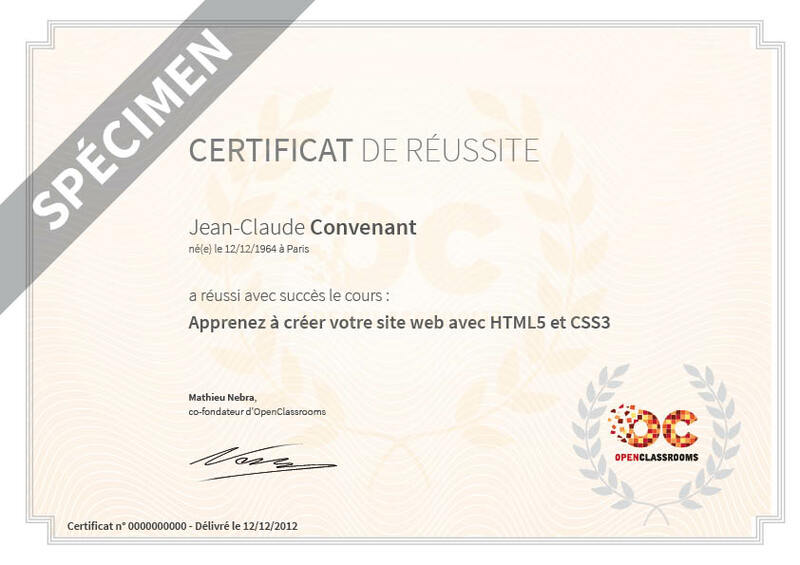 Finally, I will show you how to achieve eternal glory by publishing your module on NPM. Do you remember this line? It was right at the start of our first code. I told you that it was a call to Node.js’s "http" library (or should I say to the "http" module). When we do this, Node.js will search on our disk for a file called http.js. Likewise, if we ask for the "url" module, Node.js will search for a file called url.js. Where are these .js files? I can’t see them! Given that they are part of the core of Node.js, they are always available. Don’t put the .js extension in the require()! What if I don’t want to put in a relative pathway? Can’t I just do require('test')? The next figure summarizes all of this. ... /home/mateo21/dev/node_modules, and so on! 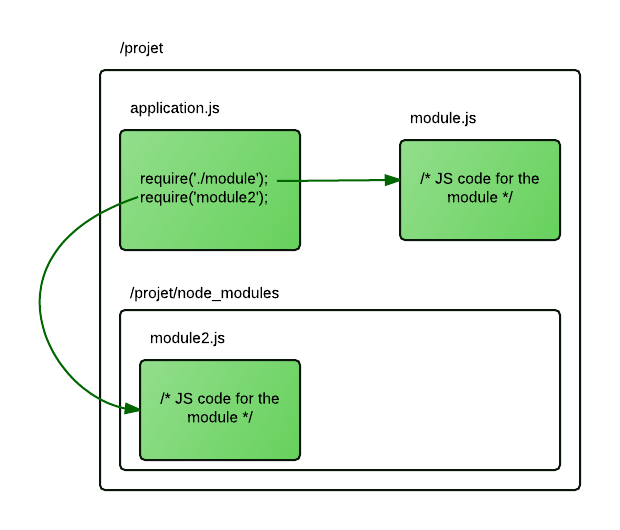 What do the modules .js files look like? Just one detail: you have to "export" the functions that you want other people to be able to reuse. The start of the file doesn’t contain anything new. We’re creating functions that we’re placing in the variables. From which the var sayHello = function() comes from. All the functions that you don’t export in your module file will remain private. They won’t be able to be called for externally. However, they will be able to be used by other functions within your module. Now, in your app’s main file (ex: app.js), you can call for these functions from the module! require() returns an object that contains the functions that you exported in your module. We store this object in a variable of the same name mymodule (but we could have given it any other name), like in the next figure. This allows you to divide your project into several small files to spread roles. 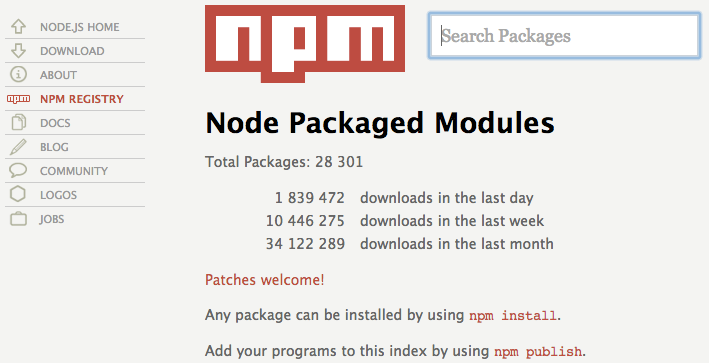 I told you about NPM in the introduction, the Node Package Manager. I told you that it was a (great) way of installing new modules developed by the community. Imagine that NPM is a bit like apt-get in Linux for installing programs. A simple command and the module is downloaded and installed! On top of that, NPM regulates the dependencies. This means that, if a module needs another module to function, NPM will go and download it automatically! NPM has a website: http://npmjs.org! As the NPM website says, it just as simple to install new modules as it is to upload your own modules. It’s a big part of what Node.js’s success is down to. It’s actually quite easy. I’ll show you a few ways of finding modules! It will launch a search for all modules that have something to do with the PostgreSQL database. If like me you like wandering around and don’t really know what you’re searching for, you will probably like http://nodetoolbox.com/. 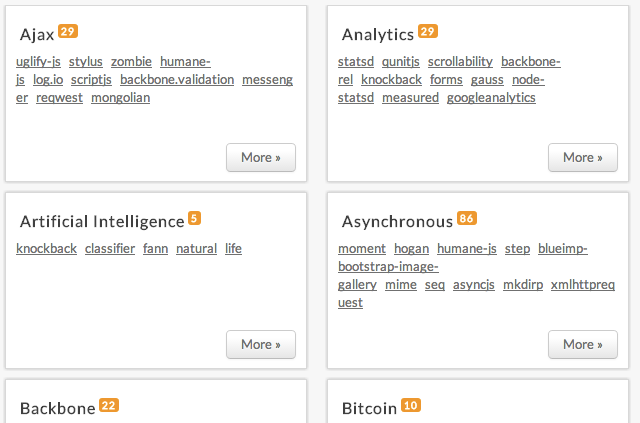 It organizes the modules by theme (see next figure). The module will be installed locally specifically for your project. If you have another project, you will need to relaunch the command to reinstall it for the other project. This allows you to use different versions of the same module depending on your projects. Come on then, let’s do a test. We’re going to install the markdown module, which converts markdown code to HTML. NPM will automatically download the latest version of the module and will place it in a node_modules sub-folder. So check that you’re in the folder that contains your Node.js project before launching this command! Once that’s done, you have access to the functions offered by the ‘markdown’ module. Read the module’s handbook to learn how to use it. It tells us that we need to call for the markdown object within the module and that we can call the function toHTML to convert Markdown into HTML. Don’t be surprised by require('markdown').markdown. The module handbook tells us that the functions are in the "markdown" object, so we will search for this object directly within the module. NPM installs modules locally for each project, which is why it creates node_modules sub-folders within your project. If you use the same module in 3 different projects, it will be downloaded and copied 3 times. This is normal and it will allow us to generate different versions. So, it’s a good thing. However, it needs to be said that NPM can also be used to install global modules. This is useful in the rare cases where the module provides runnables (and not just .js files). Globally installed modules can’t be included in your Node.js projects with rrequire()! They’re only there to give supplementary commands in the console. If your program needs external modules, you can install them one by one as you have learnt, but you will quickly see that it becomes complicated to manage. This is especially true if you use multiple modules. As these modules evolve from version to version, your program might become incompatible following an update to an external module! Thankfully, we can sort all of this out by defining out program’s dependencies in a simple JSON file. It’s a bit like our app’s ID card. name: is the name of your app. Keep it simple, avoid spaces and accents. version: is the version number of your app. It is made up of a major version, minor version, and patch. I’ll come back to that right away. dependencies: is an array listing all the module names which your module needs to function as well as the compatible versions. This file can be much more in-depth, I’ve only shown you the essential values here. To find out more about the functioning of package.json files, I would recommend that you take a look at the following cheat sheet: http://package.json.nodejitsu.com/. A major version number. In general we start with 0 whilst the application is not considered to be mature. This number doesn’t change often, only when the application has undergone very profound. A minor version number. This number is changed each time the application is changed a little. A patch number. This number is changed for each little bug or fault correction. The features of the app remain the same between patches. It’s mainly for optimization and unavoidable corrections. The next figure goes over all of this. Here, I chose to start numbering my app at version 0.1.0 (we could have started at 1.0.0 but that would have been pretentious ;) ). If I correct a bug, the application will go to version 0.1.1 and I will need to update this number in the package.json file. If I significantly improve my application, it will turn into version 0.2.0, then 0.3.0 and so on. The day that I decide that it’s reached an important turning point and is mature, I’ll be able to turn it into version 1.0.0. However be careful: a module can change a fair amount between two minor versions and your app may be incompatible. I recommend accepting only patch updates, it’s the safest option. With Node.js you can create an app for your own needs, but you can also create modules that offer features. If you think that your module could be useful for other people, don’t hesitate to share it! You can publish it on NPM very easily so that other people can install it for themselves. 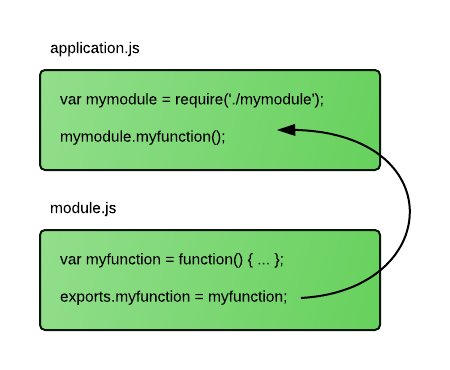 Remember that a module is nothing more than a Node.js app that contains exports instructions to share features. A package.json file that describes your module (at least its name, version and dependencies). A README.md file (written in markdown) which presents your module in more detail. Feel free to include a mini-tutorial to explain how to use your module! Your module is published, the glory is yours! You can create Node.js modules to decouple your code and avoid writing everything in one file. You can call your modules with require() as you do with official Node.js modules. All the functions in the module file that can be called for externally have to be exported with the exports command. NPM is the Node.js module manager. Like ‘apt-get’ and ‘aptitude’ in Linux/Debian, it allows new modules to be coded by the community in the blink of an eye. Modules downloaded with NPM are installed locally by default in a node_modules sub-file of your app. The -g extension allows a module to be installed globally for your entire computer. It’s only useful for a few specific modules. You can share your own modules with the rest of the community by creating a package.json and a simple call to ‘npm publish’.